20% off your ENTIRE purchase – in stores & online. -20% off offer effective through 11/17/18 at 11:59pm PT. -Offer not valid on "special" or sale items, or clearance items ending in $0.99 or $0.97.-Offer not valid on products by the following brands: all baby gear, all PB Modern Baby, all Harry Potter™, all Lilly Pulitzer, the entire Minted Collection, all mattresses, all MSRP product and select Star Wars™, west elm x Pottery Barn Kids collection (modern baby), Babyzen, Beaba, Emily & Meritt, Ergobaby, Doona, Inglesina, Life Factory, Medela, Nuna, Skip Hop, UPPAbaby and Disney•Pixar Cars .-Offer valid for one–time use. -This offer may not be combined with any other coupons, discounts or offers. -Offer not valid on prior purchases, gift cards, taxes, shipping or processing charges. -Offer not valid on prior purchases, purchases with gift cards, or taxes. 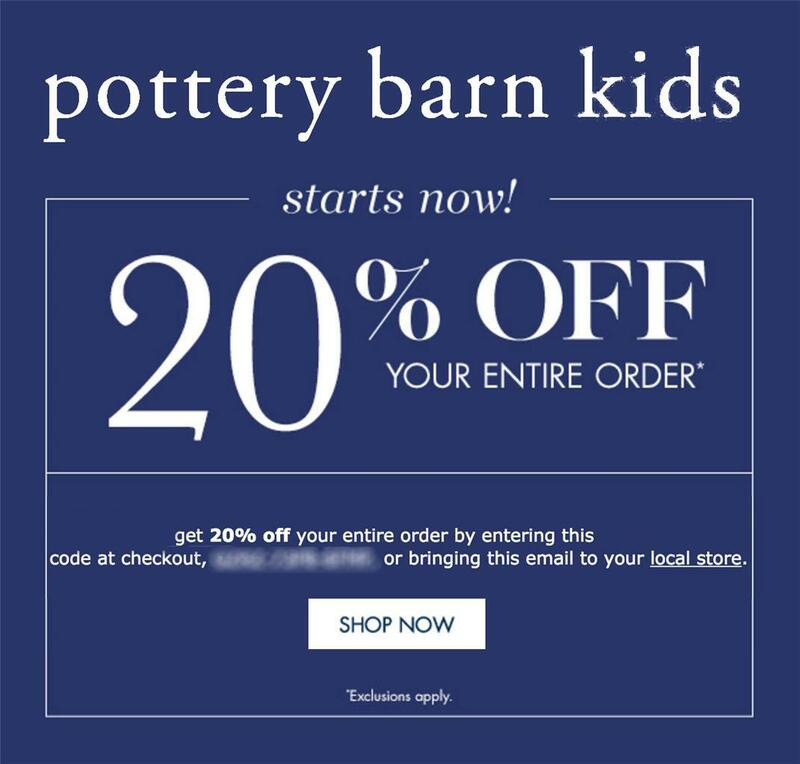 -Offer not valid at Pottery Barn, PBteen or Pottery Barn Outlets.